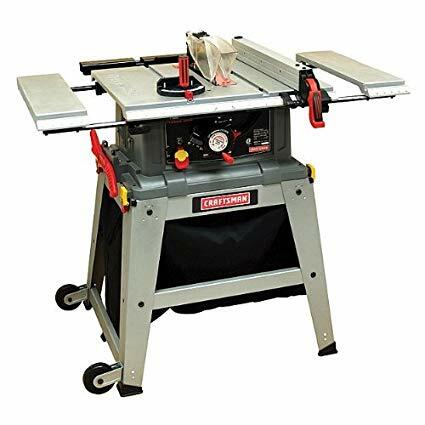 Looking for a shop table saw that doesn’t weigh a ton but still has the power of a cabinet saw? We’ve looked them over and compiled this list of the top five hybrid table saws for you. 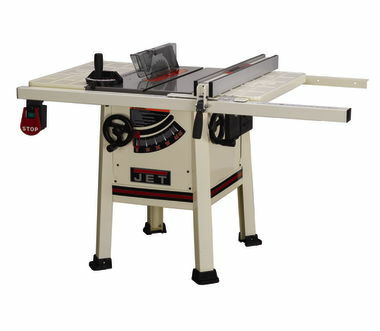 The Jet 708492K JPS-10S Proshop Table Saw tops our list as the best hybrid table saw. In the world of table saws, there really is nothing like a Jet. Keep reading and find out why. combine the powerful motors found in cabinet saws with the lighter weight stands and components traditionally used by contractor saws. So, when you’re looking at hybrid saws, keep in mind what kind of stock you’ll be cutting and what size motor you’ll need. must be taken into serious consideration. If a fence can’t be set within .005” of square, at a minimum, then accurate cuts will be a problem. A fence that slides smoothly, sits squarely and locks down tightly is an indispensable aspect to consider. is another important aspect of a shop saw. Hybrid saws have the same ability as cabinet saws to hook up to dust collectors but how the blade sits will determine if the dust gets collected or not. If you don’t have a dust collector, it still helps to have a blade that is set correctly so that the dust shoots out of the back of the saw, as intended, and not out of the throat plate and into your face. can range from 1 hour and 45 minutes to 4 hours on these hybrid saws, so keep that in mind, too. A good saw is worth the time, but assembly time isn’t the only factor to consider. We’ve done the work for you so keep reading to find out what saws come out of the box ready to go. is important when working with these powerful saws. The two main safety features to look for are the power button and the blade guard. Power buttons should be large and easy to “hit” with a leg, an arm or a scrap of wood in case of an emergency. Blade guards need to be easy to adjust and the best ones allow you to see the material where it meets the blade. 1 ¾ horsepower motor will rip 2” oak with no problem! The riving knife is set perfectly on this saw to ensure reduced chance of kickback. The riving knife and blade guard have quick release features for easy and tool-less mounting and removal. Excellent rip fence, very square right out of the box. It has an enclosed cabinet and an incredibly sturdy leg design that make this a great choice. The table is cast iron and rock solid, ensuring that it won’t warp or bend under continuous, all day work conditions. It can take almost any size dado blade so no worries there! It runs off of 110v so you can plug it in anywhere. Excellent dust collection (if hooked up to a dust collector). You’ll love the low vibration due to the heavy-duty cast iron table and solid legs. Very heavy and requires more than one person to set up. Longer assembly time than some of the other hybrid saws. Priced at under $1,400 this saw is worth every penny. It’s a workhorse with every feature you could want in a reliable shop saw. Powerful 2 horsepower motor can cut through anything you feed it! Large 4” dust port easily connects to a dust collection system. Great rip capacity at 30” on the right side and 15” on the left. Solid cast iron table top with 4-foot steel wings to support sheet material. Fence can be lifted off and locks in the front and the rear. Quick change blade feature and two anti-kickback pawls that can be positioned away from the workpiece. Interchangeable true riving knife for safer non-through cutting. A clever foot lever can be pushed down, lifting the saw off of its stable legs so that it can be rolled around the shop. Big Boys! This really helps for quick blade changes and to absorb vibration. Clear blade guard allows you to see the material where it meets the blade as you cut. Reviewers have mentioned the table not being flat. Inconsistent fences and other materials. The Shop Fox is a little higher priced than some others at just under $1,900, but it’s got a powerful motor and a lot of great features. Be sure to keep this on your list! 13 Amp, 3450 rpm motor. Heavy duty cast iron table to reduce vibration. Front and back clamping aluminum fence is lightweight, locks tightly and moves smoothly. Accessory slots allow for the installation of auxiliary fences for larger work pieces. Single action foot pedal to help you lift and reposition the saw with ease. Just make sure, when you’re assembling the saw, that you put the front of the saw and the front of the stand together correctly or the casters will not work right! Die-cast miter gauge for accurate cuts and positive stops. 30” rip capacity on the right side and 15” on the left. Lifetime Service Agreement from Ridgid if you register the product within 30 days of the purchase from a licensed Ridgid dealer. Free service, free parts for life! The motor is a little on the small side if you plan to cut through hard, thick stock like 2” oak or hickory. “Stop” button is awkwardly connected with a long wire leading to the saw body. Ridgid makes some decent tools for hard work. This saw is no exception and, at less than $800 it’s one of the best hybrid table saws under $1,000! Heavy-duty cast iron table top reduces vibration. Easy and fast assembly compared to other hybrid table saws. One-piece, heavy-duty rail system for accurate cuts. Automatic power-failure blade brake stops the blade within seconds of the power being shut off. Beisemeyer style fence with dual rip windows. Accepts all common sized dado blades. Optional version with a whopping 52” rip capacity. Cast iron wings, instead of steel, sets this saw apart from the competition. Tool-less riving knife and pawl assembly and removal. Unique tubular stand provides maximum support, like the roll bar in a Jeep. Hybrid table saw reviews mention too many plastic pieces that can easily break. The motor can struggle to cut through thick, hard stock. Delta has been a standard in power tools for many years. They’ve made this saw to help you get any job done with less effort, so you can relax and reap the rewards of your labor. Priced under $1,200 it’s a DIY dream saw with the bells and whistles that a contractor requires. Definitely keep this one in mind when shopping for a hybrid saw that won’t break the bank. This saw can be detached from the base, unlike most other hybrid saws, and then used as a tabletop saw. Laser-Trac helps you to make precise, accurate and speedy cuts. The 15 Amp motor screams at a whopping 5,000 rpm! Comes standard with a dust bag and a push stick to help make your job cleaner and safer. Accepts common dado blade sizes. Extendable out-feed support for more control over long pieces of stock. Extra wide base for stability and support. Lightweight and more portable than other hybrid table saws. Great price point for budget conscious shoppers. The rip fence is not easily squared – it has to be manually checked each time you move it. Lightweight saw leaves little to absorb annoying and unwanted vibration. Plastic body instead of steel or cast iron. Craftsman power tools are made for DIY and homeowners who don’t need to spend a fortune. The Laser-Trac is great if you’re not used to using a table saw and provides an extra level of comfort knowing where the blade is going to cut. At less than $300 this saw can do whatever you need done. The votes are in and the Jet 708492K JPS-10S Proshop Table Saw comes out on top as the best hybrid table saw for your money. It’s a solid saw worth buying right now. All of the saws have their own unique features and abilities. 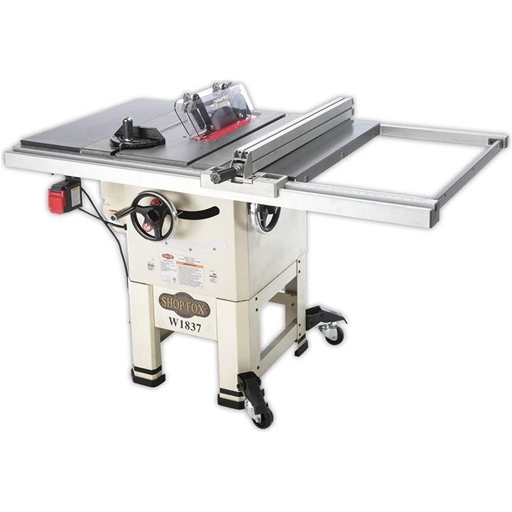 Choosing the right hybrid table saw to meet your needs is what’s important, right? So, decide what your needs are, match those needs to the models we’ve reviewed for you and get ready to buy one of these indispensable tools! Best Table Saws Review is a participant in the Amazon Services LLC Associates Program, an affiliate advertising program designed to provide a means for sites to earn advertising fees by advertising and linking to amazon.com.